GET HARD’s premise is that of a wealthy banker – James King (Will Farrell) – sentenced to maximum-security prison for fraud. With 30 days to get his affairs in order before lock-up, he hires the man who washes his car – Darnell Lewis (Kevin Hart) – to get him prepared for life on the inside. The entire premise is built on King’s racist assumption that because Lewis is black, he has been to jail. It’s not subtle, there’s a whole scene dedicated to the statistics of African American incarceration. But Lewis has not been to jail, he doesn’t have so much as a parking ticket on his record. While this is part of a larger plot to paint King in the most unlikable light possible, it’s worth pointing out because this entire movie is based on racial biases and pre-conceived notions about class, race and sexual orientation. But even for two skilled comics, boundaries are pushed beyond taboo territory and well into tawdry. For instance, using a trip to a gay bar to prepare for being attacked in prison. There are too many “don’t drop the soap”-type jokes to recall – even if I wished to remember. It’s a shame that the writers fell back on such hackneyed, outrageous jokes because there were some truly funny moments. Early in the story, Lewis decides to turn King’s mansion into a prison type atmosphere. Watching the private tennis court transform into a “prison yard” was clever. Watching King’s housekeeping and landscaping crews take revengeful joy out of treating their formerly difficult boss as an inmate is fun. Even John Mayer’s cameo was entertaining. But the story disintegrates as the movie goes on with less of a story than a long string of silly scenes and crazy hijinks – attacking a white supremacist clubhouse with a flame-thrower is one example. Directed, and partially written, by Etan Cohen (TROPIC THUNDER) GET HARD loses it’s spark after setting the scene. 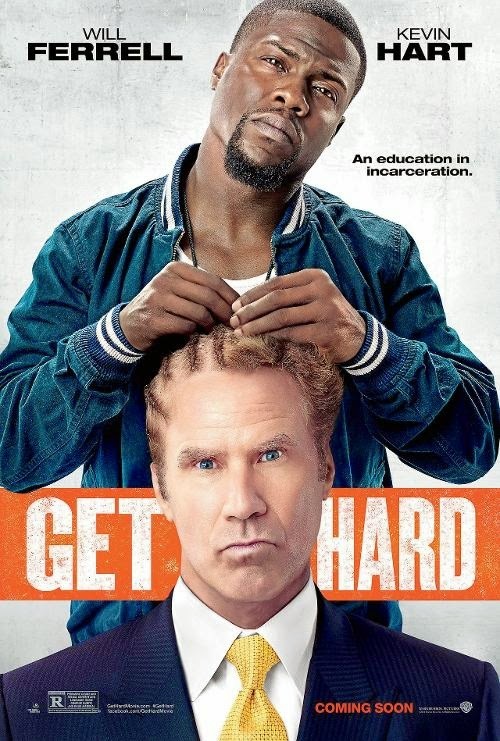 But Ferrell and Hart have a way with laughs, even without a worthy storyline to stand on. Ferrell has built a comedy career out of clueless characters. Not much changes here, as King is yet another typical example, much like characters Ferrell has played in ELF, ANCHORMAN, STEP BROTHERS, TELLADEGA NIGHTS, etc. In this case, his stupidity is awfully improbable considering King supposedly graduated from Harvard Business School, but maybe that’s a political statement. He’s painted as unlikable as possible, elitist, wildly racist and homophobic. Ferrell manages to get laughs, but this character doesn’t have the staying power of his more popular personas. Hart (THE WEDDING RINGER, LET ME EXPLAIN) plays a much more likable fellow, a family man and hard-working entrepreneur. Despite not knowing a thing about prison, King’s misguided request for training is a lucrative deal and it’s too good to pass up. Hart’s GET HARD character is perhaps more even-keeled and laidback than his real-life persona, and he’s very funny in that capacity.